In the Army, there's always going to be a need for soldiers who can build things. Carpentry and Masonry Specialists, which is categorized as a military occupational specialty (MOS) 12W, handle a wide variety of building and masonry duties. If you're good with a tool belt and aren't afraid of heights (some of the structures you'll build are quite tall), this may be the Army job for you. Ideally, you'll have a desire to work with your hands and be OK with working outdoors in all kinds of weather and conditions, including combat areas. A knowledge of science and math is useful as well in this job. 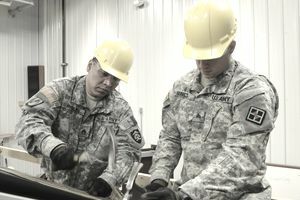 Soldiers in this job build and maintain structures like trusses and rigging devices. You'll assist with combat engineer missions, doing basic carpentry and masonry, and build framing, sheathing fabrication, and roofing structures. You'll also build concrete forms for columns, slabs, and walls. This job will find you stationed anywhere in the world where the Army needs builders and will vary based on active missions. Your skills will be in high demand, and you'll work closely with Army engineers on a lot of projects. You'll learn basic concrete tech, including proportioning and control tests, the correct way to use finishing tools and techniques like edging, jointing, curing and protection. By the time you've completed your training, you'll know the basics of structure forming, flooring, and roofing. To be eligible for this job, you'll need to score at least an 88 on the general maintenance (GM) segment of the Armed Services Vocational Aptitude Battery (ASVAB) tests. There is no Department of Defense security clearance needed for this MOS, but you will need normal color vision (no colorblindness), and be able to meet the heavy strength requirement. It isn't the job for you if you suffer from vertigo; you have to be able to climb, balance and work in high places regularly. Chances are good you'll be outdoors a lot of the time. It is one of the Army jobs that best prepares you for a steady civilian career. You'll be qualified to work in a variety of roles in commercial and residential construction and may even be prepared to work as a foreman on various job sites. Make sure you research any licensing or training requirements in your area, but you'll have the skills needed for these jobs.